We only started working on this on New Year's Eve, since we were out of town for the rest of the holidays. Ryan had to go back to work the next Tuesday, so this year's puzzle took us quite a bit longer than usual to finish. The lower left and upper right corners were the most difficult - I took to just sorting the pieces for the lower left by shape and at times figuring them out by the slow process of elimination. We were given another puzzle this year as a present, which I'm excited to put together next year. This year's puzzle we purchased at a local toy store. Ryan was a little wary of the store as we pulled up because the entrance is rather run-down looking. But I assured him that I'd been inside before and that it was not as run-down on the inside. This toy store (and another one we've been in while here) have not only a great selection of toys, but also a great selection of puzzles, both for kids and adults. In previous places we've lived we've been stuck with big box stores like Walmart or Target (perhaps we just haven't found the local toy stores in our other locations?) where the puzzle selection is dismal. In past years we've walked out of the store very disappointed after poring over the selection for what feels like forever before settling on the one half-way decent puzzle we can find. But at this toy store I came back after a few minutes and Ryan had found this puzzle. We spent a few more minutes looking over them together and noticed several others that we'd enjoy and Ryan pointed out a large one that will be fun to do with Gareth when he's older. We managed to restrain ourselves to just the one puzzle for now, but it's great to know we have somewhere we can go to buy great puzzles for future years! Ah, Norway... Looks great! I admire your patience. I've never been much of a puzzle person. Oh my, I was super excited when I saw this post because a) it's Norway, and b) I was going to post a picture of our Holiday puzzle as well...when it gets done. Yes we are still working on the 2000 piece puzzle, I shouldn't have gotten such a big one. There are also sections where you have to go through each piece before finding the right one. I couldn't think of another way to do it. It is the Neuschwanstein Castle and the sky and trees are KILLING ME. We are so close to finishing, but still working on it. I have to finish it soon because it is sitting on my kitchen table and I really want my table back. Anyway, great job! Do you frame yours or put it back to pieces? I was so excited when I saw that Ryan had selected one of Norway - I'd love to go back and spend more time there one day! Andrea, we break them back down into pieces to be done again years down the road (it's no fun to do them again too soon). We did a 2000-piecer a couple of years ago and it definitely took quite a while (most of ours are 1000 pieces). It was of Times Square and the sky on that one was also a killer. 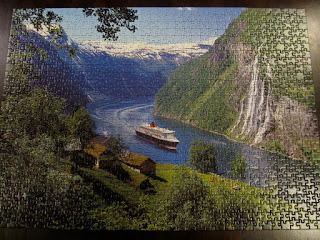 My parents have one that's only something like 500 pieces, but it's called "Lost in a Jigsaw". All the pieces are exactly the same shape and the puzzle is of a labyrinth, so you have to put every section together correctly so you can work your way out of the maze. Ryan thought it would be simple before he started it one time and now every time he sees it he comments on how much he hates that puzzle! But we enjoy the challenge most of the time. You should definitely invest in a table you can use just for puzzles so your kitchen table doesn't have to be occupied forever! That's a gorgeous puzzle! And my first thought was, "Those trees would have been HARD!"